For this month’s drink, I considered writing about several summer classics, and was nearly persuaded that a paean to my proletarian love — cold beer — might suffice in both the “pure sunshine in a glass” sense, and because it’s typically my leading beverage in terms of volume consumed between June and September. The problem with writing about beer though, is that everybody knows what it is and in order to be at all original you have to search for some obscure brand made in some far-flung part of the world in order to keep the reader interested, and even then, it might be a struggle. So I’m leaving that thorny problem for another month when I’m feeling particularly inspired. Whereas beer, in all its forms, is a year-round drink that can be enjoyed as readily on a frosty January evening, as well as in the shade of a palm tree, the subject of this month’s DOTM can only really be drunk in the summer. Or at least, it is to me one of the quintessential tastes of the summer. I’m talking about the fantastically unique aperitif that is pastis. I forget when I had my first pastis, but I very much doubt I was above the legal drinking age. My mother used to order one occasionally when we were on holiday in the south of France, and as a lifelong fan of all things licorice and anise/aniseed flavored I probably found the aroma coming from her glass irresistible, and waiting until my parents were distracted, I suspect I took my first sip. And ever since, the sight of a glass, perhaps a third-full with yellowish-grey pastis and a solitary cube of ice next to a sweating pitcher of water, never fails to remind me of summer holidays, of warm flagstone terraces under my feet and the hum of cicadas in the bushes. It’s certainly an evocative memory and it (mostly) prevents me from drinking pastis during weather that necessitates wearing shoes or socks. To me, pastis simply connotes relaxation and warm summer evenings, and it seems I’m not alone. In his second book about his adopted region, Toujours Provence, all-around Francophile author Peter Mayle says that he cannot imagine drinking pastis in a hurry. “There has to be heat and sunlight and the illusion the clock has stopped.” Now, few of us are lucky enough to be able to enjoy our pastis with a view of Mount Ventoux and fragrant fields of lavender swaying into the distance as he describes, but I think the recipe for enjoying pastis is one that can travel given the right weather and the right attitude. In the US, pastis is fairly easy to find. Almost all decent French bistro(t)s sell it, or at least, have a bottle of it behind the bar, and are most likely to stock one or both the two most popular brands in France: Pernod and Ricard. However, and perhaps owing to the fact that it’s not that popular over here, few places really know how to serve pastis properly. I remember one time not long ago at a restaurant near us in Brooklyn, being given a 12 ounce glass of pastis, being charged $5 for it, and barely managing to make it through the ensuing meal without falling off my chair. Pastis, you see, is 45% alcohol and should always be diluted. 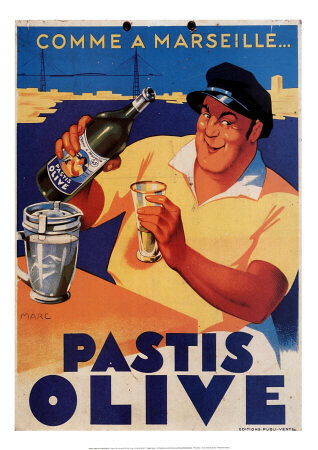 And, interestingly, the alcohol content has a lot to do with the rise in the popularity of pastis. At the end of the 19th century, absinthe was very popular, but being distilled from wormwood and wine must to around the 68% mark, it was hallucinogenic, addictive and dangerous – Van Gogh is reputed to have cut off his ear and Verlaine to have shot Rimbaud while under its influence — and so in 1915 it was made illegal. Find yourself a warm evening and somewhere to sit outside. Remove shoes and socks and place feet on warm ground. Now, take a high-balls glass and pour in a generous shot of whichever brand of pastis you like. [If you’re visiting France, there are many small local brands to choose from depending on where you are, so why not try one you’ve not seen before?] 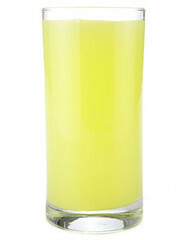 Then fill the glass up to about ¾ full with cold water and watch the pastis change from thick and yellow (or slightly green in the case of Pernod) to a milky pastel, then add a couple of lumps of ice to fill it up to the top. Then, enjoy. For many, the taste is too licoricey, but I happen to love licorice and the extra licoricey aroma that the star anise gives it. I also love the change in color and the fact that you can re-dilute your pastis once you’ve drunk it down a ways, to extend it and, perhaps, sober up a bit. I also love the way pastis gives you a roaring appetite. It’s probably the best aperitif for that this side of a dirty vodka martini, and enjoyed with bare feet and the sun sinking into the horizon, it never fails to engender relaxation ahead of a meal eaten outside surrounded by the noises and aromas of summer. Try it with a bowl of tapenade, good olive oil and some rounds of crusty bread, and you’re set for the beginning of a great meal. Vive l’ete! I first tried pastis after reading an article about it in Saveur, probably about 10 or so years ago. I loved the whole mystique — the clearish liquid turning cloudy, the ritual of the ice and the beat-up metal water pitcher that is always in the background in pictures. So I tried it and loved it and now I always keep a bottle of Pernod in my stock. I remember the liquor store guy scratching his head and looking around and digging up a bottle from a bottom shelf, literally dusty. It has gotten more popular lately, though, and I think a lot of recipes calling for a splash of Pernod helps its popularity. I do drink it year-round, though. I even served it one Christmas to a few guests (“Do you like black jellybeans? Then you’ll love this…”) I guess I don’t have the nostalgia of having it in the Provance. Or, perhaps, it’s just from living in Florida — it has been in the 60s or higher during Christmas week where I live. I cut my teeth on ouzo years ago when I lived in Greece. I would never order it myself but once you started talking to some old-timers at a taverna, ouzo was the logical progression. I never think to order Pernod here in Spain, or whatever the hell they call their version. I’m stepping out right this minute to meet up with friends at a café a few steps from my place. I’ll know what the Spanish call it when I get back (if they have their own take on licorice liquor). It’s not like I need much prodding to experiment with new booze but thanks for the reminder. I used to always order Pernod at a great Seattle bistro called Le Pichet on 1rst Avenue. It looks exactly like every bistro in France except you don’t have to go down a winding staircase to the bathroom and there isn’t an old woman attendant. I almost felt obliged to take my passport when I went there. I just found your blog so I have a lot of catching up to do. ¡Salud y buen provecho! I havent had this in ages. Someone mentioned other versions. I liked Ren Raki and Arak too(not sure of the spelling but the Turkish and Lebanese versions). I don’t know what Pernod-Ricard (yes, this French company has become a big producer of beverages although the founder Henri-Louis Pernod opened his first destillery in Switzerland) sells as Pernod in the US. But over here in Germany Pernod isn’t really a Pastis but a Pastis-like liqueur with only 40% alcohol instead of 45% every real Pastis I’ve seen so far has to offer. In other words a (not so cheap) imitation of the real thing and a very distant echo of what the brand Pernod used to be at the high of Absinthe’s popularity (they even don’t make a good Absinthe anymore). Plus Pernod is artifically coloured. 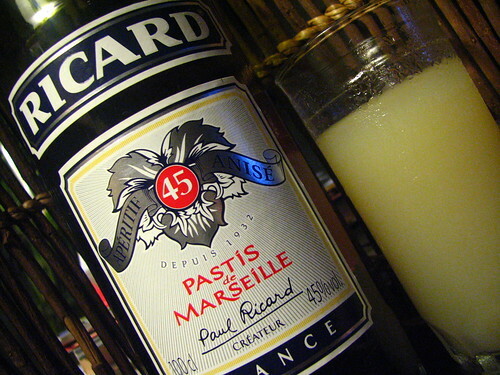 And their real Pastis Ricard isn’t the best one available in my opinion. Try Janot for example (they also offer an organic Pastis) or – even better – Henri Bardouin, which even features some tonca beans as spices used for mazeration. Ahhhh, yes, Pastis is fabulous! Thanks for the history. You know I’ve never tried this but want to of course! Sounds wonderful and thanks for the history and all the great information! I do enjoy a glass of Pastis from time to time. I have a set of lovely glasses that I found somewhere and they have the word “Pastis” etched on each. That is what prompted me to buy my first bottle of Pernod. I LOVE PASTIS!!!!! they actually don’t sell it in pa (at least not ricard which i prefer to pernod) so i have to go to jersey to get it. My friends call it the beast. i’m not sure why but i think it is bc they can not resist it and as the night goes on the drinks start containing less water. i’m so excited this is the drink of the month bc it is def my drink of summer. nothing better than sitting outside with a nice glass of the milky heaven. Ohh, liquor is so interesting. I’ve heard of Pastis, but I didn’t really know what it was. Well, now I do! And I’m going to try it, the next time I get a chance. I like licorice flavors, thanks to my mom. I would have fallen out of my chair, for sure! PeterMarcus – i hadn’t thought of the black jelly beans angle before, but you’re right on with the flavor. Happily, pastis doesn’t leave you with a black tongue, though! LeftBanker – welcome and thanks for visiting! Do let us know what the Spanish version is. Courtney – it seems most Mediterranean countries have their own licorice flavored liquor. One that we’d not seen before last summer was finochetto – actually made with fennel – but still mildly licoricey and very delicious! PastisLover – thanks for the other marques de pastis suggestions. In the US, and the UK, if I remember rightly, the Ricard is at the 45% level. I wonder why they reduce it in Germany? Generally, only the mass-produced brands are available here, but I’m sure others can be found at specialist vendors. I see continuing research in my future – oh well, anything for science! Susan – i’m a sucker for those vintage-esque thick glasses with the makers’ labels on them too. I’d love to get a ricard water jug, just to have it. I think you can order them from Ricard, but that’s not as much fun as finding them at a yard-sale. Maria – great to hear you’re on the same wavelength! A limit of two glasses on an empty stomach for me. Heather – interesting fact. It all makes sense now! Emiline, Grace, Noble Pig – you should definitely give it a try, but be gentle with yourself the first time. You can always add more pastis in, but you can’t take it out, so start with a moderate amount, dilute, taste, and then adjust as you like. Enjoy! I meant the Pernod brand here in Germany. You can only buy 0.7 litre bottles with 40% in Germany. Whereas years ago, when I used to drink Pernod as well (I didn’t know about the Henri Bardouin back then – and believe me, there’s really no turning back to Pernod once you drank a few glasses of HB) and when there really was something like duty free inside the EU, you could purchase a 1 litre bottle with 45%. Odd. Pastis when diluted with water isn’t really strong…I guess you could compare the alcohol content to a good red wine then but it’s much more refreshing. Very nice article, thank you. We love Paris and yet I drink mostly a wide variety of wines when there. I just returned from the liquor store buying some summer mixers. I bought Pernod and Ricard and have just tried each side by side. (it was this taste test that prompted me to Google the names for comparisons that lead me to your site) I like the Ricard better. A rounder, smoother flavoring, evoking a richer feel while the weight is the same. I look forward to trying local varieties in the future but Ricard will always have a place in my bar. Thanks again for the perspective. This is a drink I have always wanted to try. I will start to look around Rome to see if I find it. I just found your website and am thrilled to know that others know about Henri Bardouin. I have been drinking it for years and have not found anyone else who knows it. I still can’t buy it in Miami and have to wait for friends to bring it from France. Is there another Pastis as good???? Thanks so much for your blog. I am a foodie and will be a regular from now on. During my year in Southern France in the towns Six-Fours-Les-Plage and Le Castellet (it isn’t spelled Castoullet like in the article.) I drank plenty of Pastis. Mostly Richard because Paul Richard is buried on an island that was a ten minute walk from my home in Six-Fours-Les-Plage. I figured “of course I’ll drink Richard.” Though, one of my fiends 51 so I enjoyed my fair share of that too. I also tried Janot. In my opinion, Janot, 51 and even Richard Pastis taste the same, or at least close enough to not matter. However, I came back to Missouri with a 750ml bottle of Henri Bardoun (I had not tried it in France) and have found that it is 100% different than the major Pastis manufacturers. Is is better? I don’t know. It is most defiantly more complex and I can taste the herbs and spices. I love the HB but Richard will always have a special place in my heart. One other comment. I’ve heard it said that Pastis is very French. I have to disagree. During my time spent with the French I found that Pastis is very “Southern French.” I never once saw a person with pastis in the North of France or in Paris But several times a day (starting early in the morning in some cases) I saw people of all races, creeds, sexes, and ages drinking pastis in Southern France, and even in Southern Italy. What a fun drink. thinking about setting up my own but I’m not sure where to start. @Susie: you know what? I have never tried it after a meal, only ever before. The hole it makes in your stomach certainly creates an appetite so there’s no reason that a pastis after dinner wouldn’t help as a digestif. Duly noted!